Reports from our readers on recent - and future stamp issues. "Darley Street PO Bradford the new labels had not even been inserted. Apparently there was a fault with its alarm and an engineer was coming out to fix the problem BUT was not expected until dinnertime or early afternoon. "Leeds The Markets Post Office I did a test purchase of 1 x 1st class to check the contents. The result was one Union Flag stamp and the receipt shown at right. One of the machines had already broken down the previous day and because the main person responsible for the machines was on leave, a substitute had filled up the alternative machine. Unfortunately she had put the roll of new labels in the receipt paper section with the results as seen. I can't even guess how many misprinted receipts must have been produced prior to my arrival. "I pointed this malfunction out to the poor lady and she immediately tried to rectify matters but only succeeded in rendering the second machine unusable. Guess what, she would have to send out for another engineer - she wasn't too happy when I suggested she ask him if he could open safes and I declined to hand back my 'receipt' for the test purchase. "Leeds St Johns PO - no problems, purchased the Lakes with no problems." "Visited the village PO and the lady said that, in accordance with the information they had been given, she put the Murray stamps out on her counter on 1st August. It wasn't until 11.30 that morning that POs got a 'broadcast' telling them to remove them as the release date wasn't until the 8th.!" Update: the sheets are now properly on sale - but the branch has no blank first day covers - nor have others in the area. Another reader mentioned the Murray sheet at his sub-post office and they denied all knowledge of it, even after he had shown them the picture. It would be interesting to know that date of the comment about the Bradford office, as the machine was dispensing the Freshwater life 2 on the 19th July, as I got a set when I visited the office after visiting the York race course fair (York & Halifax also all had the Freshwater life 2 on that date). Banbury & Oxford were still dispensing the union flag on the 6th July when I visited them on my way home from MIDPEX. Tonbridge was still vending the flag from (1) and Freshwater life 1 from (2) and Sevenoaks was dispensing Freshwater life 2 on the 4th July. Bognor Regis, Chichester, Hasting & Eastbourne were all vending Freshwater life from their machines 2 on 10th July, as was Faversham on the 8th. The Bradford and Leeds reports are from the first day, 25 June. Thanks for the other reports. The report of the Post & Go blank stamps being used as the receipts was very interesting as I did not think the stamp roll fitted in to the receipt roll part of the machine. This has made a very nice variety for the lucky person who found it but what a pity it was then reported to the staff so as no one could get a copy and they only cost 60p each. 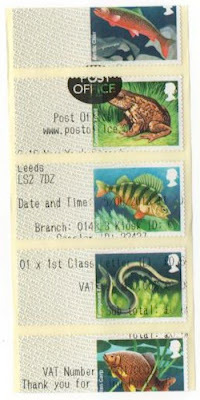 No real loss to the Post Office as the unprinted stamps have no value until the postage cost is printed on them. This would have made a nice addition to any P&G collection. Yes, Brian, it is unfortunate that more were not obtained, but my reporter was keen to get his supplies for his CDS first day covers, so he wanted the new roll put in the right place. Sadly that only broke the machine totally. He concentrates on his FDCs; if it had been one of us there would have been more - and we would have gone 'dumpster diving' as well, for the discarded ones! Quite agree Ian. Many people would have emptied the machine especially at 60p a time. Leeds is lucky to have two offices both with Post & Go machines. Many large towns and even cities have no machines at all. I find it astonishing that the PO sells stamps from a lucky bag dispenser. Or is the thrill in the chase? Not sure what you are getting at John. Offices with more than one machine often put the new ones only in one machine - and so collectors always buy a single stamp from a machine to establish whether it (is the one that) has the new stock in. If anyone is tempted to visit either of the new Crown Offices in Wandsworth (Wandsworth Southside & Wandsworth High Street) for Post & Go’s, neither office has a machine due to lack of space, contrary to what the branch finder on the post office website says. The Wandsworth High Street office sells the “collectable”. The Worlds End Crown Office in Chelsea still hasn’t got a machine either despite what the website says. Harlow, Essex. Only has one machine and for several weeks now has displayed the out of order message! You get around! Thanks for the updates. It will be interesting to see what happens on 20th - ie whether all offices immediately use the new Rivers stamps without being prompted. Australia 'GB' Faststamps - how many produced?